Side view of the Questions and Answers booth. Fully loaded. A dance much to the delight of the audience. Lord Jagannatha gazing over the crowds en masse. The audience absorbed in our stage presentation of Krishna Culture. A three day repose had us back in FOI HQ, Sandy Ridgeâ€™s own Prabhupada Village. Jagannatha Puri Dhama Prabhu, who has been with FOI since the summer of â€™03 was scheduled to be tested for a CDL (commercial driverâ€™s license) on the Thursday we needed to depart in order to be in Chicago. The pressure was on! By the grace of Lord Sri Krsna, Jagannatha Prabhu passed the complex and difficult test without difficulty, other than being admittedly, â€œvery nervousâ€. Hare Krishna! Within hours of his receiving that license, he was behind the wheel aiming for Chicago, for the windy cityâ€™s Ratha-yatra. Friday evening had the last fifteen miles of the journey lasting better of two hours due to typical traffic. Showers and some prasadam and then back in action. The tents needed to fulfill the required set-up were in place but not stood up or staked down, that would be our morning duty. As the sun rose on Chicagoâ€™s horizon, the threat of thunder showers urged us on to stand, stake, and tie the tents with haste. The new â€œWho is Prabhupadaâ€ exhibit was placed prominently so also the â€œrefurbishedâ€ Fish out of water was displayed before the public eye. Weary but eager, most of the crew assisted in the lovely one cart parade glorifying Lord Jagannatha, Lord Baladeva, and Lady Subhadra. The cart was pulled directly into the site to the delight of everyone. The distribution of a â€œfree CDâ€ proved to attract crowds to the international gift shop. Free feasting satisfied the hungry and music drama, etc. captured those seated in the large assembly of spiritual seekers. Krishnaâ€™s mercy held back the reins, in fact the weather was found to be most comfortable. One more visit to the temple for showers and prasadam before the next stop... D.C. Ratha-yatra. Arriving just as the Potomac Temple parking lot cleared after its Sunday feast, allowing FOI the 48â€™ clearing it requires to secure our trailer. Madhuha Prabhu departed that night after having remained in the cab for most of the day. He had arranged for a servicing of the rental truck, therefore he needed to be in Greensboro, NC by Monday morning. He will rejoin the remaining crew members on July 2nd when the whole party will target the Washington, D.C. Mall site on the morning of the 3rd. Fourth of July is always a fixed date on the FOI calendar, Independence Ratha-yatra and Festival of India. Tuesday evening June 12th, FOI and vehicles, safely situated in New Rama Reti Dhama. The order of the week: to facilitate the KULI MELA (A festival conducted by vaisnava-devotee- youth). Radhanatha Jakupko and Govinda Seyer and Saradia Moy spearheaded an efficiently produced package of activities and events in order to engage all festival participants. Large tents were erected for â€œcampsâ€ on business, spirituality, body&mind, children, and other targeted topics- such as prasadam distributing and kirtan (devotional music). With the permission of the local charter school a full schedule of classes from arts n crafts to yoga, palmistry to Thai massage, and a spectrum of interactive discussions and showcase presentations were conducted in classrooms and cafeteria. Enthusiasm was evident by the numbers of registered participants who each received a backpack containing a notebook, the Kuli Mela "Back to Godhead" issue, a DVD, and a beautifully designed t-shirt. The registrar greeted all as they entered a string of FOI 10x10â€™s housing a variety of wares and refreshments. Prasadam was served 3 times daily throughout the event. Certainly no one was wanting. The evenings focus was shifted to the other end of the road front layout. Closer to the temple, an expansive covered stage was illumined and amplified for a performers paradise and the audiences opportunity to enjoy. The music continued into the night and met with the morning hours. Thus, the summary of the mela stands, yet for FOI and crew, our duties began on Sunday afternoon in the blazing sunshine. By the Sunday feast, we had wrapped the camp and market place areas. Only the stage and serve out areas remained to be whisked away. SO it was that by 1A.M., the Festival of India truck poised itself for departure. We rested for dawn, packed a bite for the trip and off we went to Prabhupada Village, NC before Chicagoâ€¦ CHECK IT OUT! Arriving just in time for the Brooklyn temple Sunday Feast serve out, the Festival of India crew camped at the doorstep of the Sri Sri Radha-Govinda Mandir. 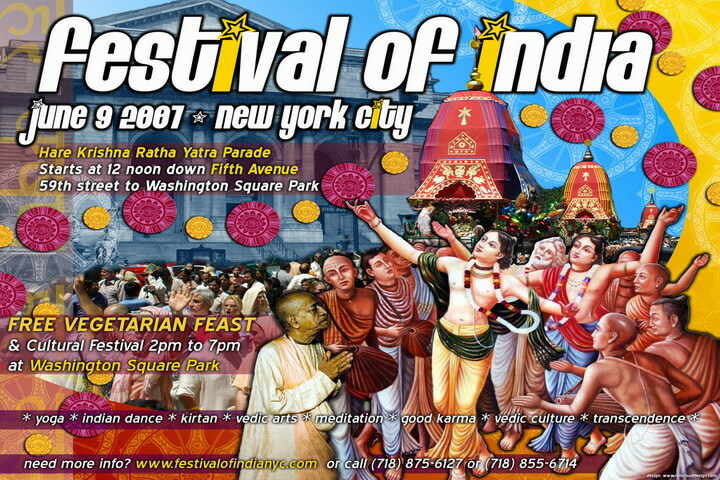 Throughout the weeklong stay, FOIâ€™s willing helpers assisted in preparations for the Saturday extravaganza- Ratha-yatra on 5th Avenue and Festival of India in Washington Square Park. On Wednesday evening, the Festival of India Players presented dramatic entertainment in the form of â€œDhrtarastra Quits Homeâ€- a play based on the thirteenth chapter of the First Canto of Srimad Bhagavatam. the final arrangements conducted by His Holiness Romapada Swami, we were set to go. The order of the day on Friday was rest, but in the noisy city streets and the heat of late spring, the option was difficult at best. Despite the challenge at midnight the crew and equipment and a few eager helpers found their way to Washington Square Park for the all night marathon and by dawn, nearly all was done. The routine rest from efforts in preparation for more filled the morning hours. Most of the crew members reappeared at Central Park South. The hug fully decorated chariots of their Lordships Jagannatha, Baladeva, and Lady Subhadra seemed to float their way down 5th Avenue on a river of ecstatic kirtan and blissful devotional enthusiasm. How a metropolitan city street becomes so purified by the glances of the Supreme Personality of Godhead is a miracle in itself, but beyond that aspect lay the event in honor of their procession. There is no end to Krsnaâ€™s pastimes, so similarly, the parade simply served to attract and deliver innumerable souls into another chapter. The circle of activities in Washington Square Park severed to please everyone. Presentations on Reincarnation including projections and personal opportunities, two q&a booths, science centers, book markets, cooking demos, â€œMANTRA YOGAâ€ experiences, what to speak of act after of stage entertainment, but the free feast attracted countless numbers. The free feast serving area located just outside the fountain circle had lines extending to the edge of the park. Such a gathering of saintly persons is rarely witnessed, especially in the heart of Manhattan. It was wonderment beyond imaginings. By nightfall, the park emptied of Festival of India equipment; it was being thoroughly swept as the snake charmer sculpture was hoisted into the back of the FOI truck. The doors closed, the engine roared, and FOI was gone back to Brooklyn for rest and refreshment. The next day, Sunday- a knockout breakfast set the pace for a knockout feast which was preceded by the New Vaikuntha Playersâ€™ (NYCâ€™s own devotional drama troupe) depiction of the story of Lord Ramacandra. We stayed for Ekadasi breakfast on Monday and managed to maneuver our way to South Carolina that day- the day of Lord Hari- we were headed for the 2007 Alachua Mela. May 18, 2007 6A.M., the roar of the Festival of India tractor and trailer broke the silence of the chill morning air as Madhuha Prabhu and his crew departed Prabhupada Village Sandy Ridge, North Carolina. Madhuhaâ€™s co-driver, Jagannatha Puri Dhama Dasa was behind the wheel as Prabhupada Villageâ€™s best boys crowded the bunks. The crew included Vrndavana, Janardana, and Madhuha Prabhuâ€™s second son, Ramananda. With only brief stops to switch drivers, we arrived in Potomac, Marylandâ€™s New Hastinapura Dhama just in time to witness the noon arotik and accept delicious prasadam. This Washington temple has engaged FOI twice per year for a long time. 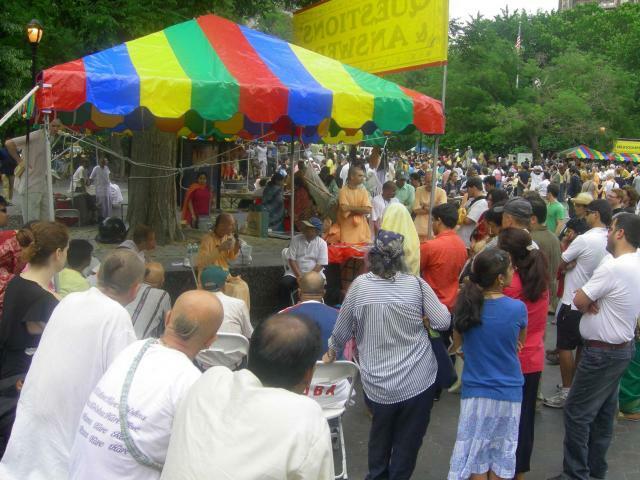 On the Fourth of July for the Independence Day extravaganza on the D.C. mall and in the autumn, FOI returns to set-up on the temple grounds for the Victory Celebration of Lord Ramacandra. After receiving the blessings of Sri Sri Gaura-Nitai, Sita, Rama, Laxman and Hanuman, and Radha Madan Mohan, what to speak of their dutiful servants (the resident devotees), we were off into the traffic. Our destination, McKeldin Square Park, Inner Harbor, Baltimore. With plan in hand, Madhuha laid out the first poles with the eager assistance of his crew. Gunesvara Prabhu from Peru who has traveled with FOI since 2004 met us in Baltimore and jumped into action. By nightfall, ropes were being tied to water barrels to secure the glisteningly new topped tents in place. An additional group of Baltimore devotees joined in the services. The result was a truly photogenic assembly. After light prasadam, the details of security and scheduling everyone to meet again the next morning for placing the displays under their assigned canopies were made. Pre-dawn, the last security shift took over as the previous sought much needed sleep. At 8:30A.M. sharp, the curb-side encampment buzzed with activity. Poles were being pulled and placed. Here is certainly a highlight. The world premier of Foeâ€™s brand new Who is Prabhupada panel display happening that morning. Fourteen expertly designed images were brought out and arranged for the first time. Madhuha Prabhu who saw this project through from the start accepted the honor of pinning and placing this glorious work of devotion. It is no exaggeration to state that the exhibit was surrounded by devotees all day long. Anyone can realize that hundreds, if not thousands of hours of devotional service were invested in the conceptualization, graphic design, photo collection, copyrighting, and assembly of this colorful replacement for the twenty year veteran display. Of course, the Illustrated Bhagavad-Gita, Science of Reincarnation, Vegetarianism: The Higher Taste, India Another World, and Hare Krsna Food For Life exhibits, all newly refurbished, stood before the great throngs of spectators and knowledge seekers. The Changing Bodies greeted passers-by at on end of the park, the fish out of water casually assumed a position at on of the cafÃ© tables in the heart of the layout, and the Bird in the Cage also attracted its share of attention. An entertainment line-up including a theatrical performance of â€œThe Gitaâ€ by Baltimore devotee youth, greetings of dignitaries, traditional dance performances, and moving musical numbers that filled the day even from before the time the guest of honor arrived. Who one might ask were the guests of honor? The answer is simple, simply supreme: The Lord of the Universe, Jagannatha Swami, His big brother, Lord Baladeva, and Their all-auspicious sister, Lady Subhadra who arrived on Their magnificent red and green canopied chariot. The Ratha-yatra was as sweet as the Lord Himself. Sweet voices, sweet dance, sweet images of the sweetest exchange of sweet devotion. This flow of Rasa flooded the hearts of all who contacted it. Then the park was over flooded with Lord Jagannathaâ€™s mercy. Day long distribution of sanctified foodstuffs attracted hordes of spiritually starved souls and fully filled their needs. The evening fell and with it a few light showers of rain, the â€œfinalâ€ kirtan led by Gaura Vani Buckwald became the soundtrack for the activities of FOI crew and assistants as within a relatively brief period of time despite the wet weather the park was cleared. Many thanks to Bhakta Ben, Tulasi and co., Bhaktin Olivia, and especially to Sunanda Prabhu who stands behind every aspect of this event since it began, and any and all the devotees who lent a hand in serving to glorify Krishna through this inestimably successful event. Oh, yes and thank you for reading about it. If you can join us at any festival anywhere at any time, you too may experience the extraordinary reciprocation of spiritual happiness derived from serving Krishnaâ€™s purpose. Pure bliss, eternal, and full of knowledge, thatâ€™s transcendental! That is all for now, but donâ€™t think us as idle; FOI returned to Prabhupada Village with Prashant of the Baltimore area who has joined the crew. Many more improvements are being made as you read this. Come have a look- Weâ€™re going to Cleveland, Ohio in June, then NYC, and on and on- have a look at our schedule. See you there! 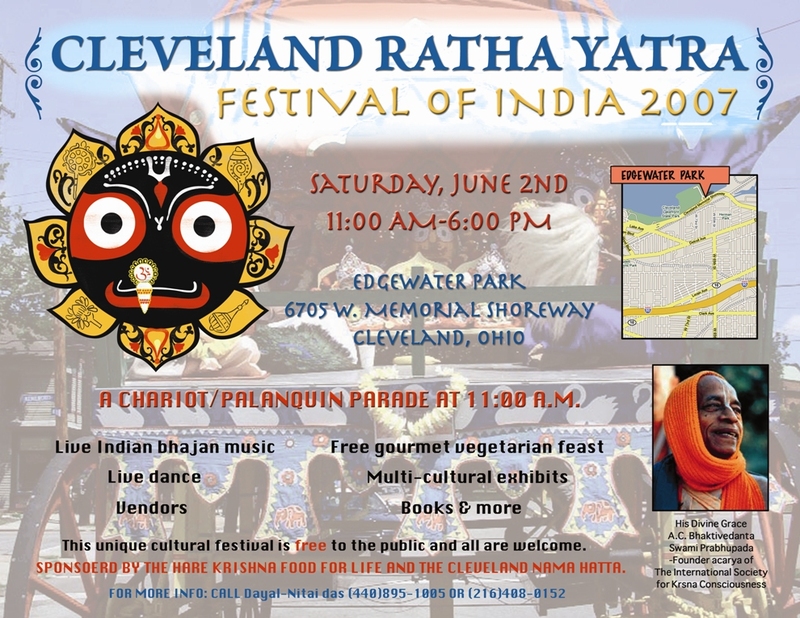 I just received these flyers for the 2007 New York and Cleveland Ratha- yatras, so I figured I'd share them with you. I'll post more as they come in. If you click on them, you can see the full size image. Google Video and Krishna Media . also, some information on the Cleveland page has been uploaded. More and more items are coming in, and we're trying to keep you informed as they come.